Cuticle oil is a substance used to moisture and improve the appearance of the cuticles, skin and nail area of the fingernails and toenails. It is usually made from rapidly absorbing vegetable oils that often times contain vitamins, nutrients and citric acid. Cuticle oil is not usually a go-to item for daily nail maintenance, but rather an option to help severely dry, cracked and damaged cuticles, nails and hangnails. Things can lead to the cuticles and nails becoming brittle and dry include excessive exposure to cold temperatures, chlorine, salt water, sun and other environmental factors. Additionally, things like biting the nails, picking at the cuticles, typing and engaging in sports or household chores can lead to cuticle and nail damage. In addition to moisturizing, cuticle oil can help increase blood circulation in the fingers and toes and stimulate new nail growth. It can also help extremely dry, brittle and cracked nails reattach to the nail bed. 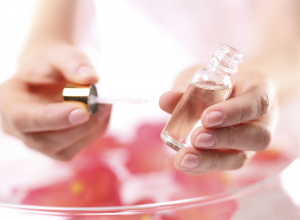 What Is Cuticle Oil Made From? Most cuticle oils are made from rapidly absorbing oils like apricot oil, flaxseed oil, jojoba oil, lavender oil, olive oil, safflower oil, sweet almond oil, or wheat germ oil. Some contain anti-oxidants and vitamins (vitamin E, for example), as well as citric acids, which help the oil dry and absorb quickly. Some brands add fragrance. Most nail polish brands produce cuticle oils. Examples include Essie, CND, O.P.I and Rococo. Other popular brands of cuticle oil include Julep, Deborah Lippmann, Leighton Denny, Mavalada, and Nails Inc. Most cuticle oils are potent potions and a little goes a long way. Therefore, it’s best to brush or drop on only a small amount of cuticle oil. Some brands have pen-like applicators that allow you to apply the oil like you’re drawing on your nails. Cuticle oil should only be used when the nails, cuticles and/or surrounding skin is extremely dry. Daily use of cuticle oil could cause the area to become dependent on the oil, and the cuticles and nails can then become permanently dry when use of the oil is discontinued. Find out how to get clear, shiny and strong toenails with just a few simple steps.